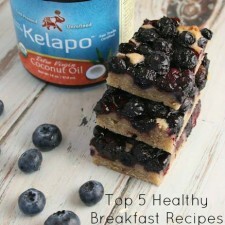 Blueberry & Coconut Bars - Yum! With July coming to an end (I can’t believe I’m saying this), the focus will now start to shift from summer fun to prepping for all back to school needs. Besides spending time shopping for new clothes and school supplies, I have realized that a lot of families start to think about what breakfast items will be made and ways to keep this interesting. Breakfast is one of the most important meals of the day and in my opinion, everyone should start the morning off with something. I’m a big fan of using coconut oil in my daily diet to reap all the health benefits from the medium chain triglycerides. When seeking the health benefits, remember to purchase an organic and unrefined coconut oil. An unrefined coconut oil still has all of the benefits of the medium chain triglycerides, which is key. I like to incorporate coconut oil in the morning for breakfast because this healthy fat is processed for energy, which may give you an energizing boost! Today I’m compiling a list of my favorite breakfast recipes, which are healthy and nutritious. Some of these you can make the day before or right in the morning to serve hot and fresh. Try switching recipes up for kids every few days to give them variety and excitement about wanting to eat breakfast! Banana Walnut Muffins – These muffins are great for a grab-and-go breakfast. I chose to make banana walnut muffins to have even more added healthy fats from the walnuts and you’ll get potassium from the bananas. You can even add in ground chia seeds or flax seeds for even more nutrients. Crustless Ham and Cheese Quiche – I love love love to make quiche! The best part about this delicious dish is that you can eat it multiple times, even reheated and it’s still good. I chose to use ham and cheese; however you can pick your proteins and veggies by what you prefer most. This is definitely a protein packed meal and is great to serve with toast. Try spreading coconut oil instead of butter on your toast for a healthier alternative – this is my favorite. Banana Chocolate Chip Pumpkin Pancakes – This recipe is gluten-free and incorporates a little sweetness to encourage eating ALL of breakfast. I think that just about anyone loves pancakes and this recipe comes out so fluffy from the pumpkin puree and coconut oil. Try topping these pancakes off with our homemade coconut chocolate almond butter – yum! 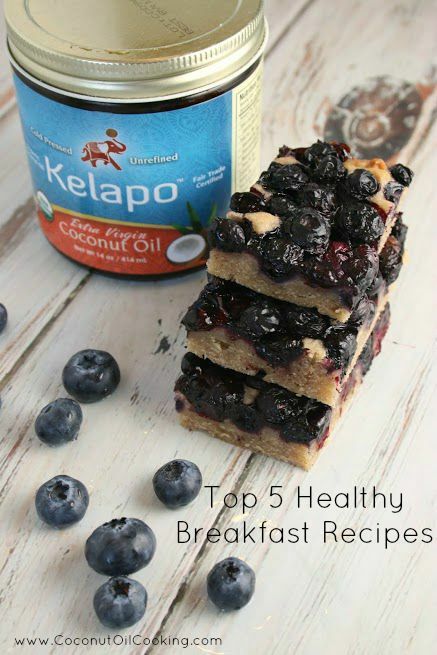 Blueberry and Coconut Bars – This is yet another breakfast item that is good for a few days once baked. These blueberry and coconut bars are simple, but packed with flavor and are slightly addicting. You can also choose to add any fruit to this recipe if your kids not a fan of blueberries. I hope that some of these recipes gave you a head start on planning healthy meals for breakfast time for both you and your little ones!